Francine McBride, community program education coordinator for Akron Children’s Hospital Mahoning Valley, has been collecting books for the hospital’s Reach Out and Read program since 2007. Reach Out and Read is a national program dedicated to fostering the development of early literacy skills among children as a standard part of pediatric primary care. Through Reach Out and Read, pediatricians and pediatric nurse practitioners give the parents or caregivers of children, ages 6 months to 5 years, new, age-appropriate children’s books as well as suggestions on how to help their children develop a love of books and reading. When she first started the program in the Valley, McBride was serving two sites at the hospital and reached 412 kids – all from one little cart. In 2011, Reach Out and Read provided books to 2,016 kids at 15 sites (18 so far this year), including genetics, nephrology, neurology, orthopedics, cancer and blood disorders, and epilepsy. Needless to say, McBride required additional storage options for her growing book collection. 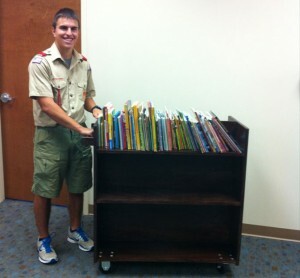 Fortunately, a member of the hospital’s Teen Outreach volunteer program had the perfect solution. Matt Carubia, a senior at Boardman High School and an Eagle Scout, chose to work on an Eagle Scout project that he could donate to the hospital. From concept to construction and the final touches, Carubia decided to create two mobile bookshelves for Reach Out and Read at Akron Children’s Hospital Mahoning Valley. 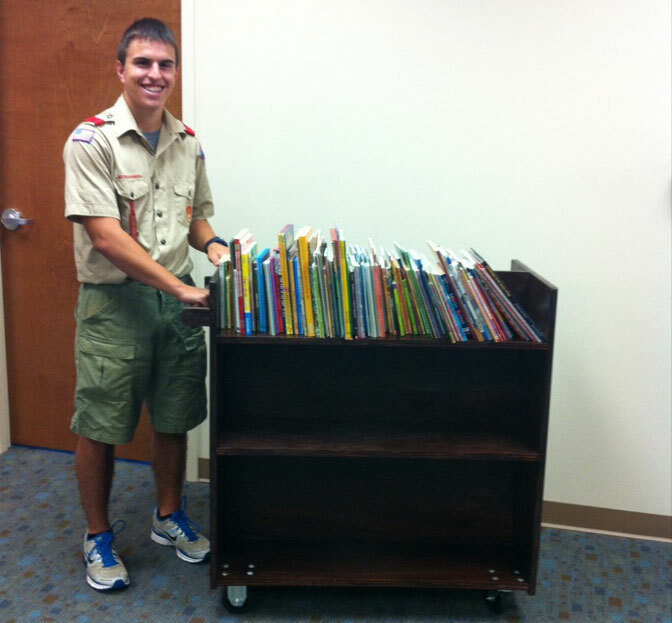 To do this he developed a 20-page proposal detailing the project, raised $350 from various community organizations to purchase the supplies, and led a team of other scouts to build and stain the carts. When the shelves were completed, he presented them to the hospital.